Ariel Matisse and Evita, Bill McMullin and Susan Tuller of Smart Pak. 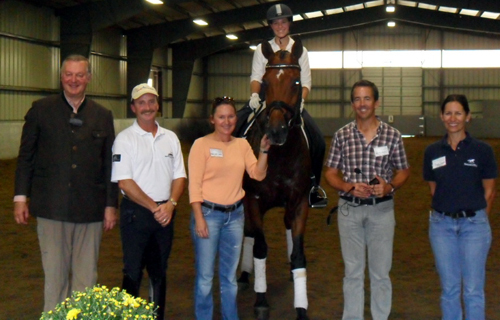 The Dressage Development Group, Nancy Later Lavoie, Bill McMullin, Bill Warren and Ariel Matisse, organized an amazing Symposium at Dry Water Farm in Stoughton, MA. September 23-25, 2011. Guest trainer Conrad Schumacher held nothing back during the two and a half day event that included training sessions and an evening dinner lecture. The riders selected prepared for three days prior to the symposium. Many had not ridden with Mr Schumacher before, giving a true description of how his system will benefit all horses. The format "Learn the System and Teach with Skill" was executed in an ingenious way. Horse and rider combinations were carefully selected to show rider training including seat, leg and rein aids, horse training including acceptance of the aids, and instructor training including teaching technique and the mental aspects of riding and teaching. Auditors were taught how to instruct in a positive way and given exercises to help rider and horse understanding. Turn out for the event far exceeded organizers expectations. Event sponsor Smart Pak and their director of sales, Susan Tuller generously ordered extra lunches and refreshments to accommodate the larger then expected crowd. In addition to Smart Pak, who went above and beyond to supply rider bags, auditor bags, lunch and raffle items, the symposium was sponsored by Karen Ramsing Bixler, Pricilla Endicott, Renee Isler, Theresa Davidson, Read Custom Soils, Dry Water Farm, ShoClothes, Windsor Marketing, www.dressagetrainingonline.com , The Gift Horse, Beth and Jeff Fanara, Cunningham Livestock Insurance, Essex Equine, The Dressage Connection, Nutrena, European Horse Trade, Highland Hill Veterinary Service, Garth Bodkin, Cape Cod Equine Associates, and David Cotrone. Friends, family and students of Nancy Later, Bill Warren, Bill McMullin and Dry Water Farm generously donated their time to make the event run smoothly. The riders who made it all possible included Susan Mercer riding her own Bianca GGF, Casey Satriano riding Theresa Davidson's Sebastian, Bill Warren riding Rohanna owned by Leslie Cokin, Leah Jamieson and Ade Lente, Gayle Paquin and her own Valor, Barend Heilbron riding Dijavan owned by Stanley Edwards, Danielle Macnamara riding her own Camelot, Andrea McCauley and Casey Satriano's Roxanne, Melissa Bilodeau and her own Versace as well as Vasilios Haseotes riding his own Sarotti the first day. Sunday viewers were introduced to the upper levels with Anne Marie Heilbron and Jane Gannon's mare Danya, Kate Mancosh and her own Belle Epoque, Courtney Fanara and her own Brighella, Stephanie Nowak and Kelly Hendrick's Malipacoa, Robin Lubert and her own Nice Catch, Ariel Matisse with her own horses, Evita and Saxaphone, Madeleine Kleine and Laura Gammell's Red Iron, Corinne Ashton and her own Dobbin as well as Bill Warren and Romantic owned by Team Romantic LLC. For more information about the Dressage Development Group please visit our website's www.warrenmcmullindressage.com and www.nancylaterdressagehorses.com. Dressage: Where Sport Meets Art - Come Ride With US!